Edwards Audio TT1 review | What Hi-Fi? Where’s the record mat? That’s the first question that springs to mind with us – especially bearing in mind the transparent nature of the TT1’s polished acrylic platter. It turns out that there isn’t a record mat. Why? Edwards Audio feels the deck sounds better this way. That transparent platter and lack of mat are the biggest differences between the TT1 and the Rega P2 deck it’s based on. The TT1 is available for £330 without cartridge, but we’ve chosen to review Edwards Audio’s complete package here, which comes with the likeable Goldring Elektra cartridge (around £60 if bought separately) already mounted. The Rega P2 has long been a favourite of ours at this kind of price level, so it comes as no surprise to find that the closely related TT1 impresses too. It has a fast, articulate sound that digs up plenty of detail. There’s slightly more agility here than the Rega manages, and a touch more expression with dynamics. The trade-off is a slightly less authoritative sound. 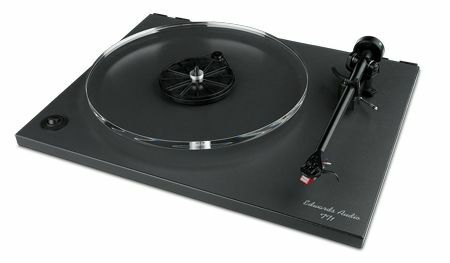 Rega’s decks are well-proven designs, and the Edward’s is a nicely made piece of kit, nicely in keeping with its forebear. Our only real complaint with it was that the lift/lower mechanism was poorly adjusted in our review sample. It absolutely refused to lift the cartridge cleanly off the record-playing surface. This was an easily solved problem, but still, disappointing to find. There’s no isolation of the deck here, apart from the three hard rubber feet, so you’ll need to take great care with placement of the deck; it’s essential to keep it well away from the speakers. Get this basic set-up right, though, and you’ll have a terrifically entertaining performer that sells for a sensible price. If you can’t stretch to a Rega RP3 – which is, after all, a couple of hundred pounds more – this Edwards deck is well worth serious consideration.